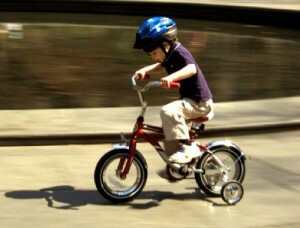 Do you remember what your first experience of riding a bike was like? If, like many of us, you recall being scared out of your wits as you gained momentum all on your own for the first time, before landing unceremoniously on your side with a clatter, there is a good chance that this event either sparked a lifelong interest in cycling: or nearly put you off it for good! Chances are: your first bicycle might not have been the perfect match for your physique at the time: so now that you are thinking about getting a new bicycle for your child, how can you be sure that you are investing in something that will be suitable, rather than something they’ll ‘grow into’? The rider should be able to easily stand over the frame, feet at either side of the bike, with a few inches of clearance from the top-most tube: of course, with so many styles of frame available today, this rule doesn’t always apply: essentially, this is to ensure that the bike can come to a safe standstill and roll off to a start with ease. With the first step out of the way, the next stage is to adjust the bike saddle to an appropriate height for your kid, so that they are as comfortable as possible when riding: the optimum position can be found by getting your child to sit on the saddle with their feet on both pedals, making sure that one side is set to its lowermost position: the leg on this side should only be bent a little: any more than a slight bend and the saddle is too low: if that leg is perfectly straight (or can’t reach the pedal), the opposite is true. If you cannot get the bike adjusted to the optimum setting using the methods above, a different size of bike may be required. Of course, many other factors will come into play: should you choose a BMX or an MTB? What frame material should you pick? How many gears are best? – this is all part of the fun of cycling and, ultimately, these are questions of personal taste: as long as your child’s bike is safe to ride and of a size appropriate to their build, you can be sure that they’ll have everything they need to make a great start in the world of cycling. Of course buying a kids bike is not just about the bike it is also about the safety of your child whilst they are on their new bike, not only their personal safety but the security of the new bike that you have just purchased. The author of this post has written blog posts on everything from kids bikes to advanced MTBs.